For a number of years in my late twenties and early thirties, Dan and I and a group of friends took turns hosting fortnightly dinner parties where we cooked a meal and played board games and enjoyed each other’s company. In the way of modern adult life, the group shifted and changed over the years and finally dispersed altogether as people’s personal and familial relationships and professional and educational goals took us in different directions, in some cases to opposite ends of the country. Usually, the rules were for the hosts to cook whatever they wanted (and could manage on a Thursday evening when most of us had worked all day and had to work again the next morning). But sometimes, we wrote a bunch of themes, put them into a hat, and drew them. The themes might be something as straightforward as a geographic region or country (Spain) or as abstract as a color (orange) or general concept (childhood). The last time we drew themes, we had written them after most of us had enjoyed a bit too much sangria, and the things we wrote down, what I remember of them, tended toward the more challenging and absurd. One theme that reappeared in various forms that night was trompe l’oeil, or foods that were, in some way, not what they appeared to be. So, folks, here I am, finally fulfilling the requirements of that challenge, just a handful of years late. 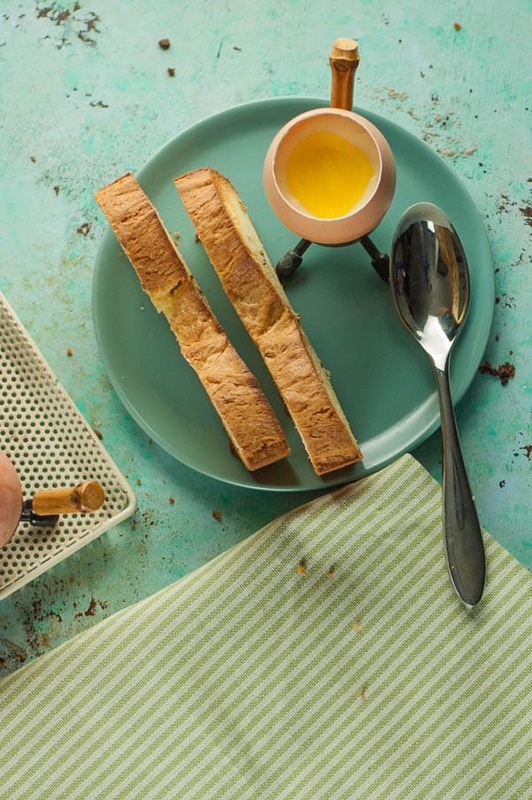 These look like soft boiled eggs and toast, but what appear to be eggs are actually eggshells (emptied, boiled, and cleaned) and filled with lemon pudding for the whites and lemon curd for the yolks. What appear to be toast is actually a fennel seed cake. They appeared in Gourmet magazine back in 2007, and the idea stayed with me, even if I didn’t follow through on making them until now. 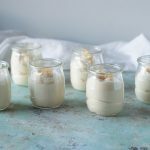 The components, especially the lemon pudding and curd, are actually quite simple to make. The fennel cake is a bit more fiddly, but you could skip that and still do the eggs for a simplified (and gluten free) dessert. I think of these as having the adorable charm of a Cadbury egg without the kind of sweetness that makes your teeth ache before you get halfway through it. 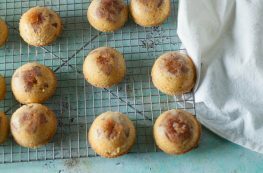 They are light and lemony and just the sort of thing that would be great for a springtime or Easter holiday dessert. 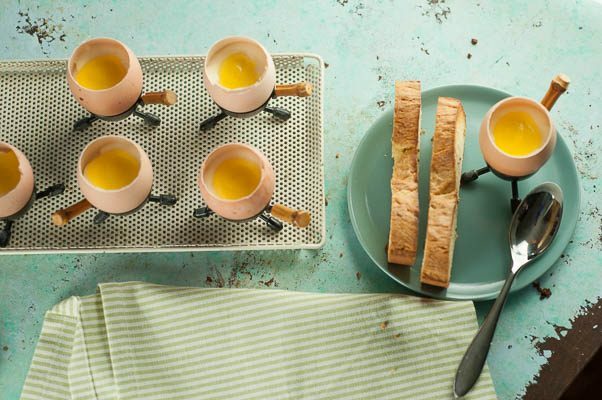 I imagine any kid or adult who likes lemon meringue pie would be a fan of these trompe l’oeil eggs. The fennel seed cake “toast” adds another layer to the illusion. I know fennel is one of those anise-y flavors that isn’t exactly universally adored. 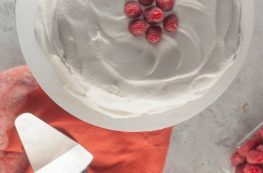 I think the cake is delicate and lovely as is, but if you’re not a fennel fan, you could omit the fennel seeds and add a splash of vanilla extract for a simple vanilla cake instead. But whether you want to bother with the cake or not, do give these lemony “eggs” a try. These deceptive “eggs” are really jumbo egg shells that have had the tops removed (I used an egg topper) and have been cleaned and sanitized in boiling water and are then filled with lemon pudding for the whites and lemon curd for the yolks. The optional “toasts” are really fennel seed cake. Don’t feel like you need to make the cake to enjoy the fun of these creamy, lemony faux-eggs, though. You really should seek out jumbo eggs for this recipe–standard large eggs will be trickier to fill and hold less of the delicious pudding and curd. I recommend having a few extra eggs on hand in case of any mishaps with the delicate shells. You’ll need 2-3 lemons to get enough juice and zest for these desserts. 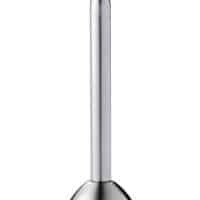 My favorite way of zesting lemons is with a microplane, and my favorite way of juicing lemons is with a squeezer like this. This makes more lemon curd than you need, but it’s tough to make a much smaller amount and the leftovers are great stirred into yogurt or spread on toast (the real kind). 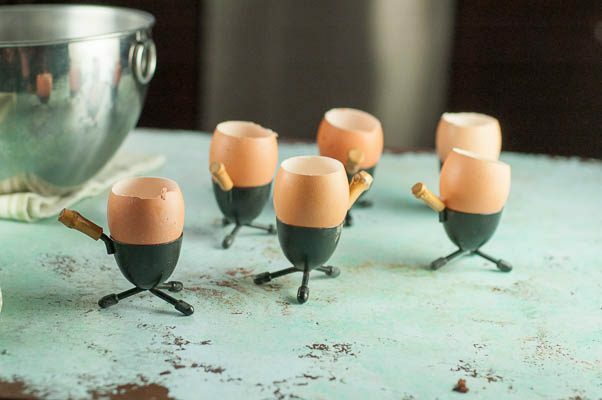 If you don’t have egg cups you could serve these in an egg carton. Open the eggs and sanitize the shells. With a knife or an egg topper like this, carefully remove the top third or so of the shells. Separate three of the eggs, reserving the yolks for the lemon curd and setting the whites aside for another use. If making the fennel seed cake, reserve the other three eggs in a separate bowl for the cake, if not, reserve them for another use. Discard the tops of the egg shells. Carefully tear away any membrane remaining in the egg shells. Place the shells in a medium saucepan and cover with a few inches of water. Add the vinegar. Bring to a boil and reduce to a simmer over medium-low heat. Simmer the shells for 15 minutes, skimming off any foam or debris. Carefully remove the shells from the saucepan with a slotted spoon. Let cool on paper towels. Wipe each shell carefully, inside and out, with paper towels to clean. Store in an airtight container at room temperature until ready to fill. Make the lemon pudding. Have a metal bowl and an ice bath (a larger bowl about 2/3 full with ice and cold water) ready. In a small heavy-bottomed saucepan, whisk together the cornstarch and sugar. Add the half and half and whisk until smooth. Bring to a boil over medium heat, whisking constantly, then boil, whisking constantly, for about 2 minutes. 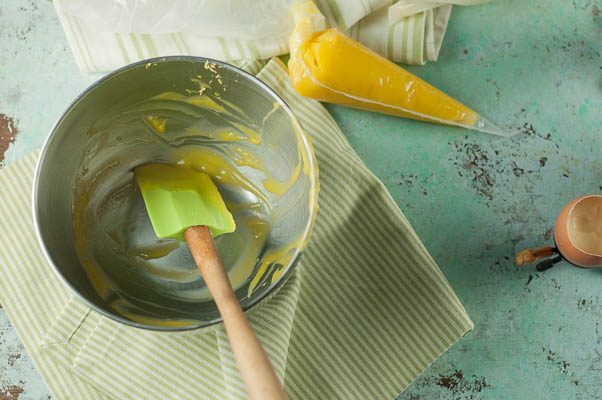 Remove from heat and whisk in lemon juice and butter, then transfer pudding to a metal bowl. Set the bowl in the ice bath and stir frequently until cold, about 10 minutes. Transfer pudding, covered with plastic wrap, to refrigerator (reserve ice water for cooling the lemon curd). Make the lemon curd. Have another metal bowl and a fine mesh sieve ready. In a small heavy-bottomed saucepan, whisk the lemon zest and juice, sugar, and yolks together. Heat over medium-low heat, whisking constantly, until the curd begins to thicken and the whisk leaves visible trails, about 4-5 minutes. Remove from heat and whisk in the butter. Pass the lemon curd through a fine mesh sieve into a metal bowl. Place the bowl in the ice bath and stir the lemon curd until cold. 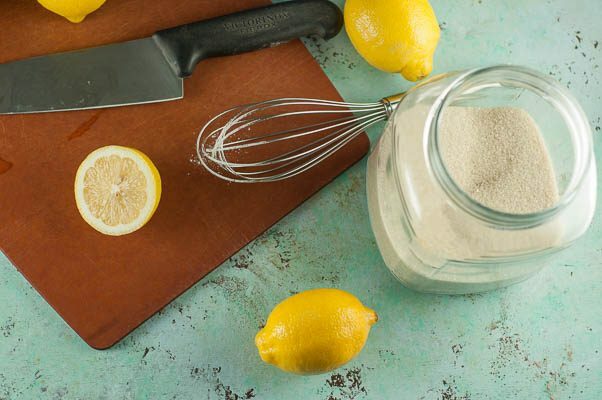 Cover the surface of the lemon curd with plastic wrap, and refrigerate until ready to use. Preheat oven to 350°F. 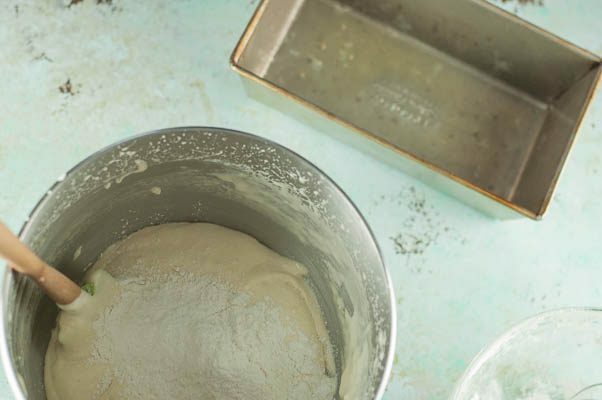 Spray an 8 x 4 loaf pan with nonstick spray. 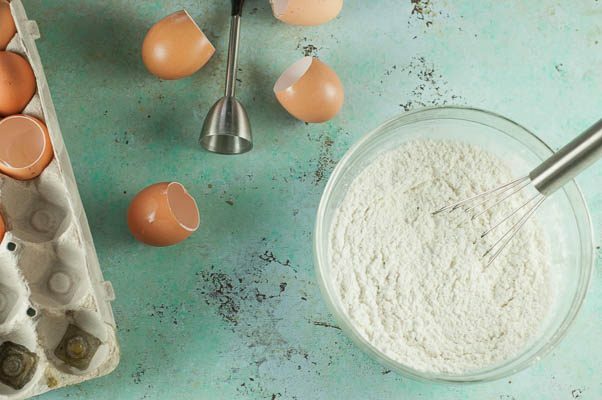 In the bowl of a stand mixer fitted with a whisk attachment, add the eggs and sugar. Beat at high speed until tripled in volume and thick enough to hold a ribbon when the beater is lifted, about 15 minutes. Add the flour mixture in three batches, folding it into the egg and sugar mixture with a rubber (or silicone) spatula between each addition. Carefully stir in the melted butter and fennel seeds. Transfer to the prepared loaf pan and smooth the top. Bake for about 40-45 minutes or until a toothpick inserted into the middle of the cake comes out clean. Let cool for 5 minutes in the pan before inverting onto a rack to finish cooling. 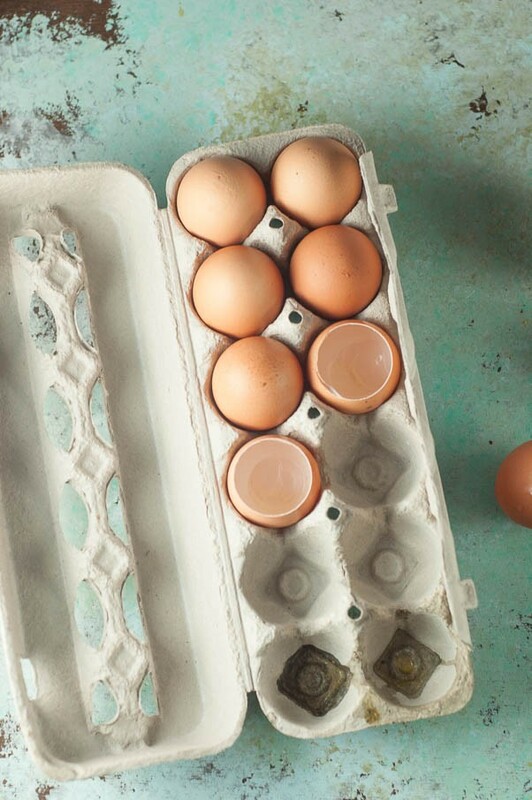 Place the egg shells in an egg carton or in egg cups. Transfer the lemon pudding to a zip top bag or pastry bag and snip off the end. Divide it evenly between the six egg shells. Make a well in the center of each egg. Transfer the lemon curd to a zip top bag or pastry bag and snip of the end. Pipe a small amount of lemon curd into the center of each egg to create a yolk. Slice the fennel cake into half inch slice (and, if you want you can toast the slices in a toaster oven to heighten the toast effect) and serve two slices along with each egg. I did the same thing years ago with a group of friends – the best trompe l’oeil at that party also involved eggs. Someone hollowed out eggshells, piped in cake batter, and baked them in the shell. It was terrific. Your dinner parties sound like so much fun. We have something similar in our neighborhood and it’s a blast. These eggs are the cutest things ever! I’ve never seen them made like this but they are show stopping! What a great way to serve dessert! Your dinner parties sound like the kind of ones we used to have too. I had to make a trompe l’oeil painting back when I was in art school– it was hard! This is so clever and fun– what a great party idea! Love this little idea! Yum! I am definitely going to have to try this out. Great dessert idea.